This news just in from the JOC camp…. 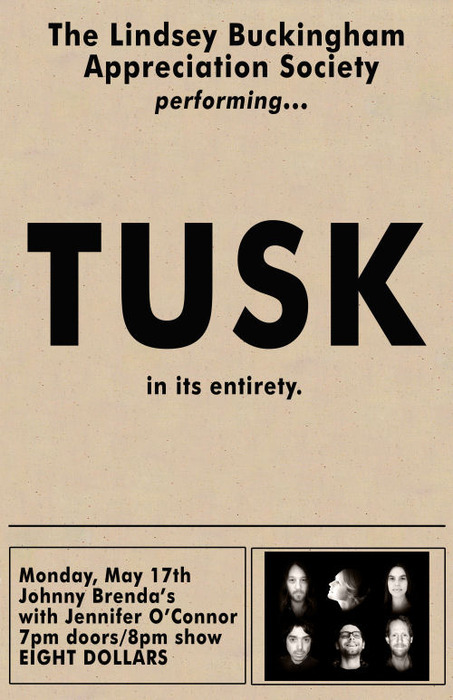 She will be joining a loose cabal of “not-so-star-ish-indie-rock-stars” at Johnny Brenda’s in Philly next Monday to perform Tusk front to back. I think this thing is also at Union Hall this Sunday. A full press release right after the jump. MARCH 29, 2010: In appreciation and celebration of musician Lindsey Buckingham’s mad genius and one of modern music’s most “punk rock-soft rock” albums, Fleetwood Mac’s Tusk, The Lindsey Buckingham Appreciation Society will perform its interpretation of the classic 1979 double album in its entirety Monday, May 17 at Johnny Brenda’s in Philadelphia, Pennsylvania with special guest Jennifer O’Connor. After five years of “Yeah, we should really do this… no, seriously!’”e-mails, phone calls, and drinking sessions, fellow Lindsey Buckingham/Fleetwood Mac obsessives Charlie Hall (vocalist and multi-instrumentalist who has played drums with Jens Lekman, The War on Drugs, Windsor for the Derby, Tommy Guerrero and others) and Patrick Berkery (drummer for Danielson, Pernice Brothers, Bigger Lovers, Mazarin and others) finally put their musical pipe dream into action in 2009, and found four kindred music spirits to form The Lindsey Buckingham Appreciation Society. The six-person collective is based out of several points along the I-95 corridor between New England and Philadelphia, and also includes Tony Goddess (formerly of Papas Fritas, currently with Jenny Dee & The Deelinquents), Birdie Busch (a Philadelphia-based singer and songwriter), Samantha Goddess (a vocalist and multi-instrumentalist, also of Jenny Dee & The Deelinquents) and Dave Hartley (bassist and vocalist with The Buried Beds, The War on Drugs and BC Camplight). The Lindsey Buckingham Appreciation Society is not a tribute act and will not perform in costume. The band features no defined character roles and is more a loving exploration of the album than a verbatim reproduction. For more about The Lindsey Buckingham Appreciation Society, visit www.tlbas.com. Excuse for being a bit off-topic here. May I ask when Cat Power is going on tour again? She´s missing in Sweden and she´s very welcome to Södra Teatern in Stockholm and Way Out West in Göteborg! Also, I wonder if you would be so kind to print a few more copies of her ep “Dark end of the street” or put all the songs in a best of -album. Thank you giving us so much good music!